Photographs supplied by Nigel Allsopp, Australian War Animal Memorial Organization. 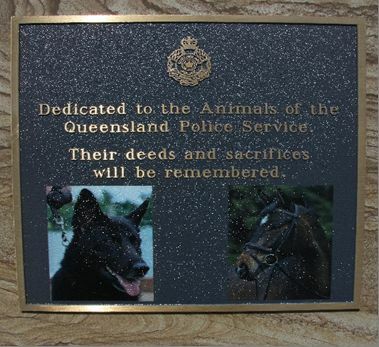 Queensland Police Service Animal Memorial is a sandstone plinth with a bronze plaque depicting a police dog and a police horse and honours the deeds and sacrifices of the many animals that have served the QPS over its 150 years. Such animals as Camels, messenger pigeon mules and even oxen which pulled prefabricated police stations into the bush. Two animals remain in service - the original police horse and the police dog. On 15 December 2014 the Queensland Police Service held the opening of the QPS Animal Memorial. Present at the ceremony was the QPS Commissioner of Police and Minister of Police Jack Dempsey. Other VIPs included the Police executive and representatives of the RAAF Military Working Dog Association, the Australian Defence Force Trackers and War Dog Association, and the Australian Light Horse Association. Members of the QPS Stock Squad (who still use horses) and many retired Police animal handlers. Four legged VIPs consisted of 4 QPS Mounted Police teams and 12 dogs from the QPS, Federal Police and RAAF. The Commissioner and MP Dempsey unveiled the memorial after the Police Chaplin blessed the plaque and recited a Police animal dissertation. The Commissioner thanked Senior Constable Nigel Allsopp a Police dog handler who had been tirelessly working on this project for several years.